Download our ebook, The Future of the Retention Marketing Tech Stack, for insights and trends that will help you build a tech stack that supercharges customer retention. 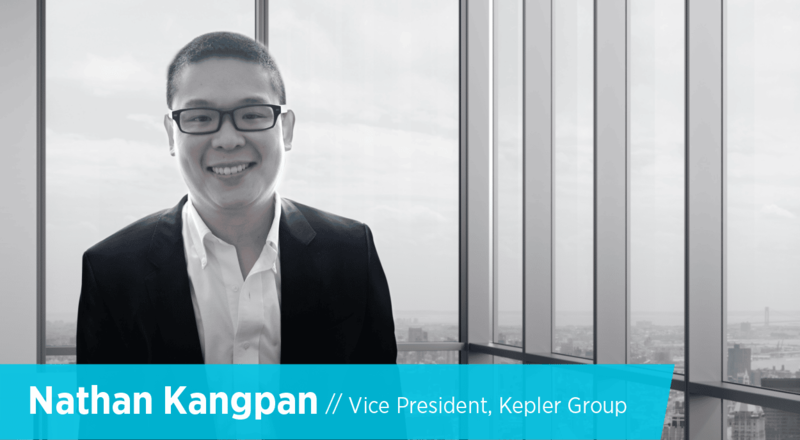 Nathan Kangpan, the Vice President at Kepler Group, is one of the most data-driven marketing leaders we’ve ever met at Sailthru — and it’s by no means an exaggeration. At Kepler Group, Nathan serves as an executive consultant to huge global businesses on how to adopt data-driven practices, integrate innovative technologies and deliver game-changing business results. In fact, they’re so good at Kepler Group, we’ve joined forces in the Sailthru Compass program so Sailthru customers can up their own data-driven marketing game with this industry leading organization. We recently caught up with Nathan to extract his thoughts on some of the topics that matter most in marketing right now, like how to triumph the challenges of becoming more data-driven, how to work more efficiently with IT teams, the future of marketing technology, and more. Check out his answers below, and if you have any additional questions for Nathan, please drop in the comment box below! SAILTHRU: You help brands become more data-driven. In your work, what do you see as the biggest challenges in the mass of customer data available today? NATHAN KANGPAN: Connecting disparate data sources to create a unified view of the customer is the most common customer data challenge we’ve worked with clients to address. It’s so widespread that we see this challenging clients as established as Fortune 500 financial service organizations to brick and mortar retailers to ecommerce startups ramping their marketing for the first time. The underlying issue is that the marketing ecosystem is becomingly increasingly fragmented as new technologies and capabilities are introduced at an increasingly rapid pace. As marketers, we all know there is tremendous potential in using the data generated across these disparate point solutions to find critical insights and then optimize holistically across channels to deliver breakthrough performance. The data is all there, it just needs to be tied together. Unfortunately, for a lot of companies out there, this is easier said than done with limited resources and infrastructure barriers. 1. Standardize Naming Conventions: Getting naming conventions and data structures consistent across channels will make your life significantly easier down the line when you try to analyze the data. For example, if you’re running a campaign across multiple channels, make sure the campaign is named consistently across each one of them like “CAMPAIGN_A_Q3_2015” allowing you to join together the underlying data sources more easily when you do your analysis. This applies all the way down the line. If you’re using multiple customer databases, make sure one source doesn’t combine “First Name” and “Last Name” fields into a single “Name” while another keeps them separate, etc. 2. Consolidate Tagging and Tracking: Where possible, try to consolidate the number of pixel solutions and ad tags you use. If you can track all your media channels using one ad server and all your customer engagement with one marketing automation engine then you’ll be able to get connected reporting from just one or two sources instead of pulling individual reports across every channel. This will drastically improve your ability to track and optimize the customer journey across every touchpoint. These sound simple, but they are incredibly powerful building blocks. I’m always amazed at how few marketers these days follow these principles! What are your best practices for marketing teams effectively working with internal IT team? This is an interesting question. I lead a technology and data team for a marketing services company so I’m always working across both marketing and IT teams with our clients. Over the past few years I’ve observed an increasing amount of friction between the two teams. One of the key drivers of this trend is due to marketers increasingly relying on technology platforms to make their programs more efficient and effective. Because these platforms are so new, both teams are a bit in the dark on which is the best to install and use. So the obvious questions are who should determine what platform gets used and who should maintain them to make sure they’re running smoothly? Should it be the end user (Marketing), or should it be the team that maintains the rest of the company’s technology (IT)? There are certain perceptions each team has about the other that contribute to the friction in picking a platform. Technology teams generally feel like the marketers don’t know anything about technology beyond the shiny user interface like how it needs to integrate with the rest of the tech stack and the total cost of ownership over time. Marketers generally feel like technology teams don’t know how to pick the tools that best address the necessary use cases. At this stage, both teams are usually right about the other team’s shortcomings. This may sound like a cop out but open communication and partnership is the key best practice in working together effectively at this stage. Vendor selection for marketing tools should be a joint decision. Marketers should have a final say in which platform they want to use from an ease of use and overall usefulness perspective. Technology teams should have final say in which systems meet security requirements, will be easiest to maintain, and will integrate with the rest of the company’s systems. Both sides have valuable input to provide and that feedback should be respected across teams. I find it incredibly difficult to make forecasts that are 5 years out because it’s hard to anticipate what kind of disruptive technology will be introduced that will fundamentally change the customer experience landscape between now and then. For example, let’s say you asked me this question 5 years ago. In 2010 the first iPad had just come out, the sharing economy as we know it today didn’t really exist yet, and now ubiquitous services like Snapchat and WeChat hadn’t been founded. Who would have accurately predicted those things amongst others would be major game changers in the past 5 years? Better Cross-Channel and Device Tracking: We’ll be able to better track the connected customer experience across channels and devices more easily. This will make cross-channel optimization easier and enable more advanced, connected marketing strategies. Several major ad tech companies that I really respect are actively working on this right now – I’m fairly confident they’ll have something within 5 years. Truly Personalized Journeys: As marketers we’ve been talking a long time about “personalization at scale.” I’ve seen a tremendous improvement in marketing automation, dynamic creative, and 1:1 targeting capabilities in the past couple years. Unfortunately, a lot of these capabilities for many providers are still somewhat siloed or limited to specific channels. In a few more years, I think marketers will finally be fully deploying across channels and not only tailoring a handful of touches in specific channels, but personalizing the entire customer journey. What would be your top-line advice for any brand trying to become more sophisticated with marketing technology today? There are a lot of shiny objects to chase after these days. Some work, most don’t. It’s very easy to get caught up in the story a lot of these point solutions tell, get excited about using the tool, and forget to think about how they may ultimately tie back to your broader marketing and business objectives. Before you try anything, make sure there’s a strategic reason to be using it and that it will integrate smoothly with the rest of your ecosystem.